00:04 Joel Harford: Hi. Welcome to the Two Journeys podcast. This is episode seven of bible study questions in Philippians. 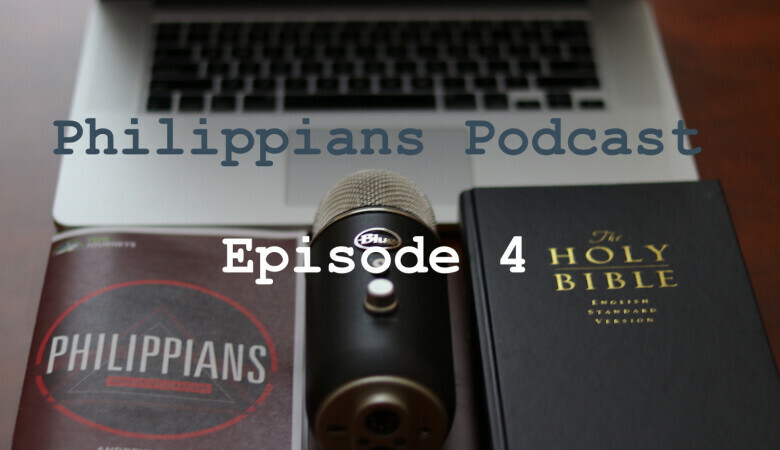 It's the final episode in Philippians, where we look at Philippians 4:2-23. I'm your host, Joel Harford, and I'm here with Pastor Andy Davis. Andy we are coming in the home stretch of Philippians here. There's some incredibly encouraging and challenging things in this chapter. Can you give us an overview? 00:30 Andy Davis: Yeah, Paul gets very specific with the Philippian church, whom he dearly loves, about elements of a happy, content, really, fruitful Christian life. And just to step through some of the very pithy statements he makes, the commands that he gives them one after the other, is so incredibly helpful for all of us. It's one of the richest practical Christian living chapters in the New Testament. 00:55 Joel: Well, for the sake of our audience, I'm going to read Philippians 4:2-23. "I entreat Euodia, and I entreat Syntyche to agree in the Lord. Yes, I ask you, true companion, help these women who have labored side by side with me in the gospel, together with Clement, and the rest of my fellow workers whose names are in the Book of Life. Rejoice in the Lord always. And again, I will say, Rejoice! Let your reasonableness be known to everyone. The Lord is at hand. Do not be anxious about anything, but in everything by prayer and supplication with thanksgiving let your requests be made known to God. And the peace of God, which surpasses all understanding, will guard your hearts and your minds in Christ Jesus. Finally brothers, whatever is true, whatever is honorable, whatever is just, whatever is pure, whatever is lovely, whatever is commendable, if there is any excellence, if there is anything worthy of praise, think about these things. What you have learned and received and heard and seen in me, practice these things, and the God of peace will be with you. I rejoice in the Lord greatly that now at length you have revived your concern for me. You were indeed concerned for me, but you had no opportunity. Not that I'm speaking of being in need, for I have learned in whatever situation I am to be content. I know how to be brought low, and I know how to abound. In any and every circumstance I have learned the secret of facing plenty, hunger, abundance, and need. I can do all things through him who strengthens me. 02:31 Joel: Yet it was kind of you to share in my trouble. And you Philippians yourselves know that in the beginning of the gospel when I first left Macedonia no church entered into partnership with me in giving and receiving except you only. Even in Thessalonica, you sent help for my needs once and again. Not that I seek the gift, but I seek the fruit that increases to your credit. I have received full payment and more, I am well supplied, having received from Epaphroditus the gifts you sent, a fragrant offering and sacrifice acceptable and pleasing to God. And my God will supply every need of yours according to his riches and glory in Christ Jesus. To our God and Father be glory for ever and ever. Amen. Greet every saint in Christ Jesus. The brothers who are with me greet you. All the saints greet you, especially those of Caesar's household. The grace of our Lord Jesus Christ be with your spirit. 03:27 Joel: So my first question to you Andy is how does this section teach us the principles for a joyful life in Christ? 03:34 Andy: Well, I think one good way to sum up the consistent message of the Book of Philippians is it really is an attitude book, having a mind or a heart in a state like that of Christ Jesus. And so, this chapter just gives a lot of pithy commands, short commands, one after the other, about Christian contentment, about joy in the Lord, about prayer life. And in all of these things, if we put them into practice we'll find ourselves being much more empowered, joyful, and fruitful in the Christian life. So I'm excited to step through it with you. 04:07 Joel: And what about discipleship? What do we learn here about Paul's approach to discipleship? 04:13 Andy: Well, Paul is really wanting to pour into the Philippians. The circumstances of writing this whole epistle comes clear in this chapter in that they had sent him money to sustain him while he was in prison. And so this really is a grand exalted thank you note. But it's so much more than that. He really wants to speak into their actual church situations, the persecution they're facing there in Philippi, the internal divisions and factions, which we'll see a little of that with Euodia and Syntyche. And he wants to just speak to them as Christian disciples, to talk to them about the Christian life, and to establish in them, especially as I've just said, heart attitudes that are going to be essential to their fruitfulness as Christians. So, that's really of the essence of discipleship. He says very plainly, "Whatever you've learned or received or heard from me, or seen in me, put it into practice and the God of peace will be with you." That's a very bold statement, but that's what discipling is all about. Especially with a mentor and somebody who is younger in the faith. The mentor is saying, "The doctrine you've heard from me and the lifestyle you see in me, follow that." So that's the essence of discipleship. 05:17 Joel: Put it into practice. So I do have some questions about Euodia and Syntyche. It seems like they were laborers, Paul loved them, they were faithful Christians, but they were having a hard time putting some of these things into practice, maybe having some fighting and division. Why is unity so important, both for internal church harmony, and our witness in the world? 05:40 Andy: Well, it's utterly vital. Jesus said, "By this will all men know that you're my disciples, if you have love for one another." And we do not naturally love one another, we are naturally sinful. We do not naturally submit to the law of God. It says in Romans chapter eight, "The mind of the flesh does not submit to God's law, indeed it cannot." And the second great commandment of God's law is to love your neighbor as yourself. This is the very thing we cannot do. And so the transformation of the Gospel and the indwelling Holy Spirit give us everything we need to genuinely love one another. 06:11 Andy: But there's still those habits of sin in the flesh, and they rear their ugly heads again and again in local church life, as they do in marriage or in family life. And that's one of the most grievous things there is in this world, the fact that we do not love each other as we should, and we're not as united as we should be. But whenever we talk about Christian unity I want to go in my mind to Jesus's high priestly prayer in John 17, where he prays that they might become one as the Father and the Son are one. And in the process of becoming one as the world looks on and sees the church becoming supernaturally united after the pattern of the Trinity, they will know that Jesus is the true savior of the world, that fruitfulness and evangelism is linked to church unity. So it's absolutely vital, though it's very difficult. 07:00 Joel: What is the role here of the "true companion"? And how does this help us understand, maybe when one Christian should get involved in resolving disputes? 07:09 Andy: Well, Paul says very complimentary things about Euodia and Syntyche. They are co-laborers with him, they are women who have stood at his side in the cause of Christ. But remember what he said back in chapter two. He pleads with the Philippians generally, that they should be like-minded, having the same love, being one in spirit and purpose. And so it isn't just these two ladies, it's just generally Christians do not get along as they should. We do love one another, we do enjoy fellowship with one another, but sin can come and divide us. And so it seems like Euodia and Syntyche came... There was some dispute between them. We don't know anything about it. But they just were not like-minded, they were in disagreement with each other, they were arguing. As he told them in Philippians 2:14, to do everything without complaining, or arguing, disputing. And they were. So along comes this guy, true companion or yoke fellow, or loyal yoke fellow could be just a nickname. It could be the pastor, one of the elders of the church. And he's asking him to step in, really, and to somewhat referee, and to be an arbiter, to some degree, and listen to each side. And to try to help these women, as Paul says right in this text, be like-minded, being of one mind. 08:24 Andy: It's almost like he wants to put the three of them in a room and say, "Don't come out until these two ladies agree." And so the idea that I've noted from this, of Christians agreeing to disagree, is really not... Should not be part of the Christian life. Although I know there's practicalities to it. We have a key decision to make, and you might have a committee, and people vote and the majority outvotes the minority. But the goal should always be to come to a genuine unity, that we see things the same way. And so I think it could be that Euodia has one perspective and Syntyche has another perspective, and they each have a valid perspective but they have deficiencies. And like a lock and key, they need to work together. And so this true companion, or this yoke fellow, is supposed to come and help them appreciate one another, and to listen to each other. 09:14 Andy: And then as iron sharpens iron, be affected by one another, and come to a genuine unity. That's the role. Now you asked, When do we get involved? Sometimes you don't want to get involved in a dispute not our own. The Book of Proverbs says, "Like a man who seizes a dog by the years, is a passerby who gets involved in a quarrel that's not his own." But that's talking about total strangers. You see some guy in Walmart arguing with his girlfriend or disciplining his son, and it's like it's best to just pray silently and keep walking because you don't have any standing. But now here we're talking about the Christian family. They know each other and they're a part of the family. We need to get involved. 09:49 Joel: I want to go to verse 5 where he says, "Let your reasonableness be known to everyone. The Lord is at hand." Why is reasonableness such a powerful Christian attribute? And what would the opposite be? 10:02 Andy: Well, one translation says gentleness. So there's a kind of a mildness here in mind. Reasonableness is... You could imagine somebody who's just losing their temper, they're really getting angry. And you could come and say, "Would you please be reasonable about this?" It means the person's lost reason and they're becoming controlled by their emotions. So, in any case, there's a sense of that mildness, that sense of that meekness and gentleness. And Jesus... It's one of the only adjectives, it may be the only adjective that I know of that he applies to himself, where he says, "Come to me all you are weary and burdened and I will give you rest. Take my yoke upon you and learn from me for I am gentle" he says, "And humble in heart." So when Jesus calls himself gentle he says, "You're going to find me easy as I come... If you come humbly and meekly as a broken-hearted sinner, you're going to find me to be a mild savior, easy to approach." And so, we should be that way with each other. We should have a gentleness or a mildness or a reasonableness in the way we deal with each other. And the reason he gives is that the Lord is near, so we should be mindful of the fact that God is with us at all times, that the Lord Jesus is... He never leaves us or forsake us, by the Spirit. And so because he's right there we should be very reasonable or mild with each other. 11:22 Joel: Do you think that's also an evangelistic emphasis that the Lord is at hand? Because it says, "Let your reasonableness be known to all." 11:31 Andy: Yeah, that everyone would know you to be a reasonable person, a mild person. Jesus had blessed are the meek for they will inherit the earth. And there's that sense of wildness. You're not easily angered, you're not a bull in a China shop. And that everyone who knows you testifies that about you. But it does not in any way mean that you're a push over doctrinally, that you're going to give up on orthodox convictions, or on the issues of sin, that we're not going to be "reasonable" about sin. If someone is caught in a sin like homosexuality, or addiction to drugs, or abuse, spouse abuse, or adultery, we're not going to be reasonable or mild about that. Those sins are destroying their lives and the lives of others. It doesn't mean that we're going to be harsh and angry at them, but I'm just saying we're not talking about being reasonable about truth and falsehood. We're just talking about being kind and gentle toward others and that's just the way you're known all the time, not just with Christians, but with non-Christians alike. 12:32 Joel: That's good. Let's talk about verse 6 because I think this probably hits every Christian, and probably every human being on the face of the earth. "Do not be anxious about anything, but in everything by prayer and supplication, with thanksgiving, let your request be known to God." First of all, what is anxiety and why is it so dishonoring to God? 12:53 Andy: Anxiety is a churning fear that captivates the mind and heart, the emotions, about the future. It's always about the future. What is going to happen? And I think what it really is, is a very bad use of a good gift from God, which is imagination. We have imagination of what the future might be like, and we think about these things. But sadly, unlike its polar opposite which is hope, hope and anxiety are almost exactly opposites. Hope is a feeling in the heart that the future's bright, that it's something we're looking forward to. Anxiety is a dread in the heart that the future is dark and terrifying. Well, the reason that anxiety is such a dishonor to God is, first of all, it forgets that God's on his throne and that he loves us as our adoptive father, and that he controls the future and that we have nothing to fear. And also, as I just said a moment ago, it's exactly the opposite of what he does want us to be thinking about the future, which is to be filled with hope. Faith is the assurance of things hoped for. 13:55 Andy: We should be filled with good hope. And that means for the rest of our lives, even if we go through pain, if there's suffering in our lives, there's a good purpose to it. God is shaping and molding us and fitting us for Heaven. So we should not be anxious about anything. The longest section on this, Jesus addresses this, is in Matthew chapter six in the Sermon on the Mount. He goes at length reasoning with us that we should not be anxious about our lives, what we eat or drink, or about our bodies, what we will wear. And he just reasons with us that we would not have this unreasonable fear about the future. We should trust God to provide for us and seek first His kingdom and His righteousness and let God take care of the rest. And do not worry about tomorrow, for tomorrow will worry about itself. Each day has enough trouble of its own. So anxiety is a very great sin and Paul fights against it here as Jesus does in Matthew 6. 14:45 Joel: In the second half of verse six and in part of verse seven, how does Paul give us a powerful weapon for fighting this anxiety? 14:53 Andy: Well, we don't know what the future holds, but what we do need to do is just give what we're aware of about the future, give it over to God in prayer. He says, "Do not be anxious about anything, but in everything..." That means in every circumstance, no matter what you're facing. "With prayer and supplications, with thanksgiving, present your request to God." So He gives different names of prayers. There are different types of prayers. And so you could look at this kind of prayer, supplication, and entreating, and prayer, and request, and all different language that people use for prayer. Paul does the same thing in Ephesians 6 where he gives different names for prayer. But I think the idea here is whatever type of prayer you want to do, it could be a prevailing persistent widow type prayer where you're doing nothing but pray, you're on your knees and you're just working over a topic. It could be a very seriously ill child with leukemia or something like that, and you're going to be praying about this one thing for an hour. Or it could be the kind of prayer you just give up at a moment like Nehemiah did in the presence of the king when he was about to make a request. You just utter a quick prayer up to God and then you go about your business. 15:58 Andy: Both of those are fine. But he said just give it to God in prayer. Take it to the Lord in prayer like the hymn writer said. Just cast your anxieties on Him because He cares for you, 1 Peter tells us. So that is a powerful remedy. There's something you can do about the topics that are making new anxious, and that's pray about them. 16:17 Joel: I appreciate that, that's really helpful. Now, let's talk about the peace of God, the peace of God which surpasses all understanding. I think many Christians have experienced this before from the ministry of the Holy Spirit. What is this? 16:30 Andy: Well, this is a powerful gift of God. When we have given something up to God in prayer, he is able to give us such a peace of mind, a peacefulness that comes over our minds, that we have no anxiety at all. A moment ago I said that anxiety and hope are direct opposites. We could also argue that at least in this text, peace is a direct opposite of anxiety. Your heart's at peace. And so God has the power to do that. Now, I want to make a distinction here between the peace of God and peace with God. Let's talk about the second first which is peace with God. As it says in Romans 5:1, "Therefore since we have been justified through faith, we have peace with God through our Lord Jesus Christ." Now what that means is that there's a status of peace between us and the king of the universe. He is not at war with us and we are not at war with him, we have been reconciled. We are in a peaceful relationship with the Kingdom of Heaven. So that would be similar to two nations that are at peace with each other, like the United States and the United Kingdom. They haven't been at war since 1814 ended the war of 1812. And so we're at peace with them, it's a status of peace. And so God is at peace with us and we are at peace with Him once we have been reconciled through faith in Jesus Christ, that's peace with God, that never changes. That's linked to our justification. It never goes away. God will never be at war with us again, he will never be our enemy ever again. 17:57 Andy: But this text I think is talking about something else, the peace of God. Or we could look on it almost like the peacefulness that characterizes God. God is a peaceful being, he's not ruffled. He's not running around like a chicken with his head cut off. He is at peace with his plans, he's at peace with his power, he knows exactly what's going on, he is at peace. "Our God is in the heavens, he does whatever pleases Him," the psalmist says. And so that is a sense of peacefulness that comes from confidence that God is on His throne. And that's a very powerful thing. And it comes and goes. Christians can sometimes feel that feeling of peacefulness and sometimes they don't, but they are always at peace with God through justification. So here, what it is, is that if you pray about something you can give it up to him. And then little by little a peacefulness can come over your heart. Like when Jesus said to the wind and the waves, "Peace, be still", and it got quiet like a mill pond. Yet your heart can get like that, and it will stand guard over you. It will guard your heart and your mind in Christ Jesus. That's a powerful remedy to anxiety. 19:08 Joel: Okay, let's talk about verse 8 where Paul gives this list: "Whatever is true, whatever is honorable, whatever is just…" And He says, the list goes on, but he says, "If there's anything worthy of praise think about these things." So why is what we think about so important in the Christian life? 19:23 Andy: Yeah, these are very, very important verses on the thought life of a Christian. It's vital for us to have a pure mind. We're told we have the mind of Christ. Earlier in this book, in Philippians Chapter two it says, "Have this mind in you, which was also in Christ Jesus." So we need to think pure thoughts. The mind of the flesh is death, but the mind of the Spirit is life and peace, and so we want to have a mindset that is honoring to God, God reads our minds and thoughts. Jesus read people's minds even while he was in the body on earth. And so Almighty God knows everything we're thinking all the time and we do have control over our thought lives. We don't have control over temptations that flitter into our minds like flashes, flaming arrows really of temptation, but the kinds of things that we kind of grab hold of, to keep with the flaming arrow analogy that we use that spark to light a bonfire of imagination where we're thinking lust thoughts or wicked thoughts that are dishonoring to God. 20:26 Andy: Those are the things that we want to see completely driven out. But what should our thought life be like? This is the greatest list in the Bible describing, and there are many adjectives, here; "Whatever is true, whatever is noble, whatever is right, whatever is pure, whatever is lovely, whatever is admirable. If anything is excellent or praise worthy, think about those things." And I could go through each one of those words and they're all gems, but I try to think of each one in terms of Christ. Christ is pure, Christ is lovely, Christ is admirable, Christ is noble and praiseworthy and excellent. So these kinds of words are characterized by Christ, so let... And also, we could say they characterize the Word of God. So there's such a close link between Christ and the scripture. Either way, you can't lose. So just... That's one of the reasons I think memorizing scripture is so good. It will cause your mind to be dominated by the words you're memorizing, and you'll think about whatever is true, noble, right, pure, lovely, admirable, excellent, praiseworthy. So my desire is that each of us should have that kind of a thought life. And we're not going to be perfect in our minds and hearts, but we want by the spirit to let our meditations, be pleasing in God's sight. 21:36 Joel: Reminds me of Psalm 1 where David says, "Blessed is the man," and in verse 2, he says, "His delight is in the law of the Lord, and on his law, he meditates day and night." 21:48 Joel: Okay, what about verse 9, we already talked about the pattern of discipleship, doing you want to add anything to what you said earlier? 21:54 Andy: Well, I think verse 9 is just a great verse for one-on-one discipleship. Also it just shows the level of confidence that Paul has in his ministry. He said to the Romans that when he comes, he will bring a full fruitfulness of gifting to them. He says in Romans chapter one, that the Holy Spirit will be there and use his Spiritual gift to bless them and he knows that they will also use their gifts to bless him. He's very confident that the Lord will use him. And so I think that's what you need. You need leaders that are confident that God through the power of the spirit, they're not arrogant boasters. But he's saying, "Look at my track record, look at the way I've lived, that's my role modeling, my example-ing, and listen to the doctrine that I've taught, the orthodox doctrine. These are the two patterns of discipleship. Whatever you have learned or received or heard from me," that's doctrine. "And whatever you've seen in me, that's practice. Put these things in your life." And then he says beautifully, "The God of peace will be with you." The same idea of the peacefulness of God. So in other words, you're going to have a very peaceful fruitful life if you imitate me and follow my doctrine. 23:01 Joel: Okay, transitioning to verse 10, where Paul talks about the provision that's been provided for him, he says, "I rejoice in the Lord greatly that now at length you have revived your concern for me. You were indeed concerned for me, but you had no opportunity." So what is he talking about here? 23:18 Andy: Well he's talking about money that they sent. I think that Epaphroditus his Messenger, or the Philippians messenger brought a bag of coins. There wasn't electronic cash transfer back then. And so it was an actual physical journey with physical coins on roads with highway robbers. And so Paul says, he risked his life to make up for the help you could not give me. And so there is this idea of the great courage of Epaphroditus. And so I picture them sitting in Paul's prison cell, and there's the bag of money on the ground. And Paul's writing a thank you note and he's just saying "I rejoiced greatly in the Lord." He has that past tense there, but I think it just means that when I saw Epaphroditus, and then he told me why he was there, it just filled me with joy. So he's just so thankful that they have, he says, "Renewed their concern" for him. It wasn't that they didn't have any concern, they just didn't have that opportunity. But now there was a chance for them to show their love for Paul and he's thankful for it. 24:14 Joel: In Verse 11, I know it's been one of your favorite verses for the last several years. He says, "Not that I'm speaking of being in need, for I have learned in whatever situation I am to be content." So what is Christian contentment? 24:28 Andy: Well, this is a very, very important topic and those of you that are listening to this podcast should know that Baker Books is going to be publishing a book that I've written on Christian Contentment based on the work of a puritan named Jeremiah Burroughs who wrote, The Rare Jewel of Christian Contentment. And I want to commend Burroughs work to you because he has been my mentor and my guide. But contentment really is in a simple way, if we just talk about the word, it's a combination, I think, of joy and peace in your heart. I think I look on those two more than anything else. There's a peaceful happiness. We use it in very simple, kind of worldly way. You could think of somebody that's had plenty to eat like on a Thanksgiving Day and they have their dinner, and it's done by about 2.30 in the afternoon. People are laying around watching a football game and their stomachs are about as full as they could be. That's a pretty carnal view of contentment. But what you're saying is, I have enough, I'm satisfied. So that's the normal way we use contentment, but Paul uses a different word here than I would have expected. I didn't realize what this word was, but the Greek word that he used here is self-sufficiency, self-sufficient. I've learned to be self-sufficient. Now that's a pretty shocking word, actually, if you know much about Paul's teachings, or Jesus's teaching. 25:44 Andy: Well, let's take Jesus first, Jesus said, "I'm the vine and you are the branches, apart from me you can do nothing." So self-sufficient attitude seems to be exactly the opposite of Christianity. Paul says in 2 Corinthians 1:9 that God put him in prison in Asia to teach him that he should no longer rely on himself, but on God who raises the dead. 26:02 Andy: And yet Paul uses this word self-sufficiency. I think what he's getting at here, though, it relates to a very powerful attribute of God, and that is God's aseity or his independence. The aseity of God, literally it's from the Latin which means, or I think from the Greek which means, "from Himself." God gets from Himself everything He needs. In other words, He doesn't need anything from physical creation. He doesn't need the universe. The proof of that is that He existed before time began, without the universe at all, so clearly He didn't need the universe to exist. The Father, the Son, and the Spirit, were completely self-sufficient and did not need the universe. Now, we should not think that that means that God doesn't take delight in the universe, or that He doesn't enjoy the universe, He does. We can bring Him pleasure and joy, but He doesn't need us. He doesn't need air, He doesn't need food, He doesn't need anything, He says in Psalm 50, "If I were hungry, I would not tell you." "Do I eat the flesh of bulls?" I do not. He doesn't need the universe, He is blissfully independent of the universe, and yet he delights in it. And so, I think Paul's thinking like this, for God's self-sufficiency is God's sufficiency. I think that's how Paul is using the term here. I've learned to be God sufficient. In other words, if I have God, I have everything I need, just like God has everything he needs, in God. So what that means is, I really don't need anything from creation either. And you're like, "Oh well, wait a minute, Paul. You're just a human being. How can you make a statement like that?" So I thought about the basic physical necessities of life. You've got air, water and food in that order. Those three things need to come into your body, or you will die. So Paul's saying, "Actually I don't need air. If you cut off Paul's air supply for three to five minutes, guess what would happen? He would die. But he already covered that in Philippians 1, he said, "I desire to depart and be with Christ, which is better by far." Oh, that's how you're talking. I get it now. So I guess he doesn't need water either. No, he really doesn't, and he doesn't need food, so he doesn't need the bag of money on the ground between his feet that Epaphroditus brought. He doesn't really need it, he will be content. 28:21 Andy: He was content before it came. He'll be content spending it on the food and the blankets that he needs. And after the money's gone he'll be content. Because his contentment's not wrapped up in the bag of money. He is free from earthly circumstances. That's what contentment is all about. And the more you look at that, it's like, "Wow, that's a pretty powerful the state of mind. That's a pretty powerful concept." Yeah, what that means is you don't have to be noticed when you serve somebody, you don't have to be thanked or praised, you don't have to be rich, you don't have to do well in your profession, you don't have to be healthy, you don't have to have the cure for cancer, your child doesn't have to survive. I mean, little by little you start to apply it to everything, you're like," Wow, I actually can find joy and peace independent of earthly circumstances." That's exactly what he's talking about here. 29:26 Joel: But it is a secret. It's something that eluded me for many years, and I think it eludes many of us. Why does Paul call it a secret? And how do we learn this. 29:35 Andy: Right. What Burroughs points out, Jeremiah Burroughs that I mentioned wrote, The Rare jewel of Christian Contentment. He said the word secret tells us two things, first of all, it's not automatic, it's not a given that Christians will have it. Actually, I think most Christians live most of their lives without displaying Christian contentment. I know that I have many, many times been discontent. And so it is possible to be a born again Christian, a believer, and to be in-dwelt by the Spirit and be discontent. I've proven it, sadly. And so have we all. So the fact that it's a secret to be learned means that it's not part of the original equipment, it's something you have to actually gain by experience. It's a learning, not in books, although the book, the Bible, and Jeremiah Burroughs book or my book can help us learn some principles. You have to live through any and every situation, you have to learn how to be in suffering and in prosperity. You have to learn by experience how to display this kind of Christian contentment. 30:31 Andy: So it's a secret to be learned, but then the good news is Paul says he's learned it. He actually has learned how to be content. And one of the great dangers of writing a book on a topic, people think you're the expert. I am not the expert on Christian contentment. There are far many brothers and sisters that are far better than I am at this, and I'm not claiming as Paul had to have learned. I want to learn it though that's my eager earning. So that's what I think the word secret means. 30:57 Joel: Do you think his night in the Philippian jail with Silas had anything to do with him learning the secret? 31:02 Andy: That's one of the great displays of Christian contentment in history. I would say behind the cross, it's the second greatest display of contentment that you will find in the Bible. Paul and Silas were arrested and beaten and thrown in a Philippian jail. Their backs were bleeding, they were in the dark, they were in a stinking prison surrounded by other prisoners who were clearly not, I will guess, believers at all. They were pagans, who were seething with rage, or they were in pain. The stench must have been horrible. I think when you think about the five senses, there was nothing pleasurable coming in any of their five senses. And so what do they do at midnight? They break out in song, they start praising God and they're worshipping God and they're singing and all the other prisoners were listening to them. And it was such a remarkable thing that God was moved and by His sovereign power, he sent the most astonishing surgical strike earthquake in history that caused the prison doors to fly open and everyone's chains to fly off, but no one was killed, and no one escaped. 32:02 Andy: Philippian jailer calls, runs and he's about to kill himself because he assumed that all of his prisoners had escaped, and out of the darkness comes the Apostle Paul's voice saving his eternal soul. I think he was hanging over hell as he was drawing his sword to fall on his sword and Paul cries out from the darkness. "Don't harm yourself. We are all here." And calling for lights the jailer rushes in and falls trembling before them, hauls out Paul and Silas and begs them the question, "Sirs, what must I do to be saved?" And they gave that timeless answer. "Believe in the Lord Jesus and you will be saved, you and your household." And so that's just an incredible display, I would say Joel, the rest of my life I want... That's my goal, short of obviously Christ on the cross, the picture of Paul and Silas in the Philippian jail, that's the most perfect heavenly contentment you can ever experience here on Earth. Because you're getting nothing of value coming in from the earthly scene and yet you're filled with joy. 32:58 Joel: Yeah, I just, I love that account, it's incredible, and it's fitfully to connect that to here, to the letter of the Philippians. 33:06 Andy: Yeah, and so as he's talking about contentment. He says, "I've learned to be content in any and every situation, well fed or hungry, living in plenty or in want." And he does all this. And Burroughs gives a fantastic definition of Christian contentment. And I'm not going to unpack it, except I'll make a few comments on it, but I want to just commend Burroughs book, and also mine which is coming out early next year. But he says, "Christian contentment is that sweet inward quiet gracious frame of spirit that freely submits to and delights in God's wise and fatherly disposal in every condition." So I just take that definition and break it into three parts. First. That Christian contentment is a frame of spirit. It's an attitude, it's a demeanor, a heart state. And he uses four adjectives to describe it, sweet, inward, quiet, gracious. So it's a sweet frame of mind as opposed to bitter or sour. A bitter person, I think, is unforgiving. They're looking at the past with bitterness. Somebody's hurt them or some bad thing happened and they just can't forgive this person or they can't forgive God. They actually can think that way, they're bitter. Or sour, a sour disposition. Somebody who's pessimistic, like Eeyore in Winnie the pooh. 34:22 Andy: So there's just that sense of a sourness. No this person's got a sweet spirit. You just love being around him. And it's an inward spirit, it's not something you act, it's not acting, you're not going to acting school, you really do have a contentment from your heart. And it's a gracious and a quiet spirit. Quiet means it's not churning and roiling. We're talking about anxiety. That's what rebellion's like as well, like a churning stormy sea. Contentment is peaceful and quiet under God's hand, it's quiet and it's a gracious frame of spirit. In other words, what Puritans meant by that, is that it can only be affected by sovereign grace. It's not something you can do by an act of the will. So that's the frame of spirit, the key thing to all this is God's fatherly disposal, why is it fatherly disposal. The disposal means God makes decisions about your life. He decided that Paul and Silas would be in prison, that their backs would be beaten, he decided that they would be released the next day, God's in charge of everything, and he's in charge, not just like a king, and that's important, but like a father. 35:24 Andy: And so, he has fatherly disposals or decisions about your life and they are wise, and so Christian contentment freely submits to and delights in those decisions. That's very challenging. To freely submit to it means you're not fighting against it, you're giving yourself freely, but more than that, you're delighting in even suffering. Because we know, as James says, that Suffering produces ultimately, Christian maturity and so that's the desire that we have. So that's just a quick overview of what Burroughs had to say about Christian contentment. 35:55 Joel: I have one more question to ask you about contentment, before we go to the next section. And that is, Paul says, "I know how to be brought low, and I know how to abound." I think most of us when we first think about those things we would think, easy to be content when you're abounding, harder to be content when you're brought low. But actually it's much different than that, it's almost the opposite. 36:16 Andy: I think so. 36:16 Joel: We have to learn both of them though. 36:18 Andy: And I think our American audience, or our Western audience, people who live in wealthy countries, underestimate the danger of prosperity to their souls. Actually, I think Spurgeon said that, I don't know the exact quote, but it's going to be rough, but it's like I met one man in a 1000 that could be content in adversity, but not one man in a 1000 could be content in prosperity. That prosperity really genuinely can destroy the soul. Now, he's overstating but it's very, very dangerous to the soul to get everything you want all the time, to be prosperous, to be successful, to be praised, to be lauded in this world, it can be a direct assault on your soul. And God wisely doesn't do that, generally gives you a mixture of reversals and trials, etcetera, but you have to learn the secret of feasting, you have to learn the secret of self-control at times like that, to not be addicted to it. 37:10 Joel: Contentment even when abounding and saying it's not about the stuff, I'm going to live on God anyway. 37:15 Andy: Absolutely. Now let's circle back to what Paul said the secret was. And right in the text, he says, "I can do everything through him who strengthens me." Or some of the translations say through Christ who strengthens me. And I think that's the secret. And you're like, "How is that a secret?" Well the idea, the concept we're aware of is that Christ is there to give us strength, but the secret is applying that to this immediate situation, and so Christ strengthens you to be content. What that shows me is that contentment is a display of Christian strength. It is a Samson like strength to be content, a man or woman, boy or girl who stands firm in Christian joy in the midst of great affliction is a very strong person. Conversely, grumbling, complaining, whining, shirking your duties because you're going through such a hard time, that's weak, that's just, that's a weakness in the Christian life. And I don't want to be that way. So he says, "I can do everything through him who strengthens me." That's the secret of Christian contentment, is the invisible Lord Jesus, through the Spirit, strengthening us in the inner person. 38:23 Joel: I love it. Now let's talk about verse 14 and on. We've talked about several times in the podcast, how the Philippians, they sent money via Epaphroditus and so he's thanking them for that. But I want to zero in on one verse, verse 17, he says, "Not that I seek the gift." So Paul is not, he's not really seeking the money, but he says, "I seek the fruit that increases to your credit." So how is it actually a credit for believers to send money to advance the gospel? 38:56 Andy: Yeah, I mean, God keeps records. He is a bookkeeper. He's up there in heaven tallying what you do and what money you give. And so he actually says, "What really excites me about this bag of coins here is that you gave it Philippians, and what that means is, as you have given by faith, everything that does not come from faith is sin but everything that does come from faith is reward-able." It's like gold, silver, costly stones, that's tested by fire. And so he's really talking about eternal rewards here, God is a record keeper, and as Randy Alcorn said in his book, Money possessions and eternity. Talking about money. You can't take it with you, but you can send it on ahead. And the way you send it on ahead, is by giving it away by faith. And so that's what he's excited about. It's what's credited to their account, what God has written down that they were generous in supporting a Christian missionary, a Christian apostle. Now that's where the cup of cold water teaching comes in, that Jesus said, that if you give even a cup of cold water, if anyone should give one of these servants that he's sending out to do evangelism and missions, even a cup of cold water to help them on the way, they will never lose their reward. 40:03 Andy: So this bag of coins was like a cup of cold water to Paul. It supported him on his way, and so they were partnering with him in his ministry. So they're going to get the same reward that he did. The support ministry people get the same reward as the upfront people do, because we have different callings in life. And so he said, "I'm really excited about the fact that this gift is now credited to your heavenly account." 40:27 Joel: And I guess that ties in with a fragrant offering and sacrifice to God. 41:12 Andy: And he gave some of that as a fragrant offering. And when God smelled the aroma he was very well-pleased. Well, this money was like that to God, it was a fragrant offering, an acceptable sacrifice, it was well pleasing to God. And then he promises, he says, "Look, you're not going to be losers God's going to take care of you, he'll supply your needs." Now keep in mind this is not prosperity gospel teaching, like if you give a faith seed amount you'll get repaid 100 fold in this life, he's not teaching that. He's saying God's going to meet your needs. He's going to teach you to be content with food, clothing, and shelter with your basic needs met, you will not be paupers on the street because you gave money to a Christian missionary. So that's the language here, and he's going to credit to your heavenly account everything that you gave, he's going to meet your physical needs and you're going to be rich in heaven. 41:58 Joel: Yeah, I know, CS Lewis talks about why Christians often are reserved in giving and he talks about how they're scared, it's not necessarily that they're greedy, like they want more, but they're scared of what will happen if they lose their security. And so I think about that when I think of, "Do not be anxious about anything," earlier in this chapter. And "My God will supply all your needs," is that it really frees us to give away our security and place all of our security in God's hands. 42:25 Andy: Yeah. That's a great word, that's a great word. 42:27 Joel: Do you want to say anything about the final couple of verses, they are about Caesar's household? 42:31 Andy: Absolutely, that's kind of exciting. And it's just one of those little glimpses you have into the progress of the gospel. Here we got this mighty terrifying mindless beast of a Roman Empire that was just crushing and devouring all these nations, these barbarian nations. We saw the image in Daniel chapter seven of this terrifying beast or the legs of iron in Daniel chapter two. And so you got this iron terrifying crushing monster, the Roman Empire, and it was fighting against Christianity. The, many of the emperors were megalomaniac tyrants like Nero and Caligula and some of these others that hated Christianity and would fight against it. But here, for all of that as Tertullian said, "The blood of martyrs is seed for the church," and the gospel is making progress. 43:18 Andy: So here, I think, let's keep it simple. Some of the Praetorian guard, they were the best soldiers in the Roman army, they were specifically entrusted like the Secret Service to guard the body, the person, I would say, of the Roman Emperor. Paul was chained to some of these men, and they were fanatically loyal to Caesar and to the empire, and yet Paul was able to convert some of them and they were a part of Caesar's household. I don't think they were part of Caesar's family, but they were in the household protecting Caesar. And we know that within the first century, very short time, there were Christian churches up in Britannia, 1000 miles north of Rome, and I think that's because of the extent of the Roman empire and some of the Praetorian guard maybe went up there and shared their faith and were bold for Christ, as they had earlier been bold for the Roman Empire. So it's pretty exciting, those of Caesar's household, he kind of says, wink wink a little code language. We're making some progress here, with the gospel. It's pretty cool. 44:14 Joel: Well it's been a joy to go through this book with you. For our listeners, this is the end of the Bible study questions in Philippians. There's a companion guide where you can lead Bible studies by asking questions from the text. It's found on twojourneys.org, and we will continue the podcast starting with Hebrews. So please join us next time. Thank you for listening and God bless you all. Thank you for listening to this resource from twojourneys.org. Feel free to use and share this content to spread the knowledge of God and build his kingdom. Only we ask that you do so for non-commercial purposes and in accordance with the copyright policy found at twojourneys.org. Two Journeys exists to help Christians make progress in the two journeys of the Christian life, the internal journey of sanctification and the external journey of gospel advancement. We do this by exporting biblical teaching for the good of Christ Church and for the glory of God.